Big news - We got a dog! 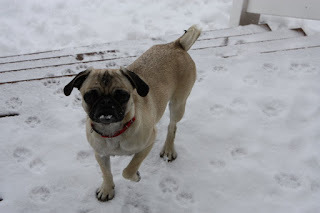 Chase has been wanting one forever, and after much searching we found an almost perfect little pug that almost fits seamlessly int our family. What's the 'almost' all about? Unfortunately we're almost positive Clara is allergic to her. We will know for sure on Thursday when Clara gets skin tested by an allergist, but all signs are pointing that direction. Poor Chase (and Brian) are in a bit of denial, and poor Clara is only comfortable when she's on Claritin or Benadryl, and I'm just trying to figure out a magic solution to it all! Here's a picture of her first bath. She actually did very well! She's fixed, potty trained, loves to play tug-o-war and fetch and run around with the kids in the back yard. She sleeps on Chase's bed at night and follows him around all day (which he loves of course). Leia is not hyper, she's actually quite mellow when you're not plying a game with her. She really LOVES to snuggle. She's timid around strangers, but warms up pretty quickly. We absolutely love her. I'll post the results of the allergy test when we get them. Cute dog...I hope Clara isn't allergic...poor girl! I thought I was allergic to my dog (remember Agnes? 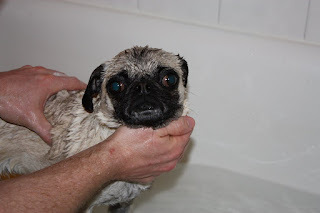 )but as it turns out, I was allergic to the shampoo we used on her. Might look at that as the culprit!